Becoming a Tourist in Paris for a few days requires changing our island mindset. In Bahrain designer purses get their own chair at the restaurant table. In Paris, the centuries-old city of pickpockets, purses are a liability. 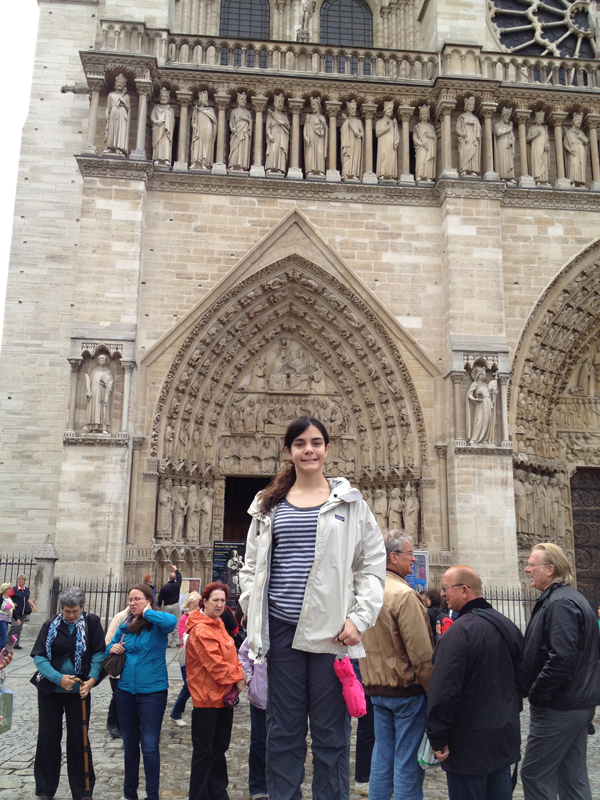 Around Notre Dame where 16-year old Esmeralda and her goat danced and performed tricks, Tourists are prime targets. This was my first European trip using my iphone as my primary camera. Lifting my arms to take Susan’s photo outside Notre Dame, I decided it was not a good idea. It was too easy to have my phone snatched from my hand like the Paris police chief. A stolen iphone would be a bigger loss than a stolen camera. Entrance to Notre Dame Cathedral is free but often there is a long line. As the unsuspecting Tourist waits, people try to “sell” you tickets. Inside the cathedral as Tourists maneuver around the darkened shrines among a throng of jostling people, the church fathers posted more signs warning about pickpockets than signs asking for Silence. Convincing children to keep quiet in church is easier if ice cream becomes a goal. However, even an ice cream expedition can become a Tourist trap. As our five children shouted their double-scoop orders, the young man suggested sitting down at a table where the waiter would serve us. After three hours of walking, it sounded like a good idea. The nine of us began crowding around tables and pulling up chairs. 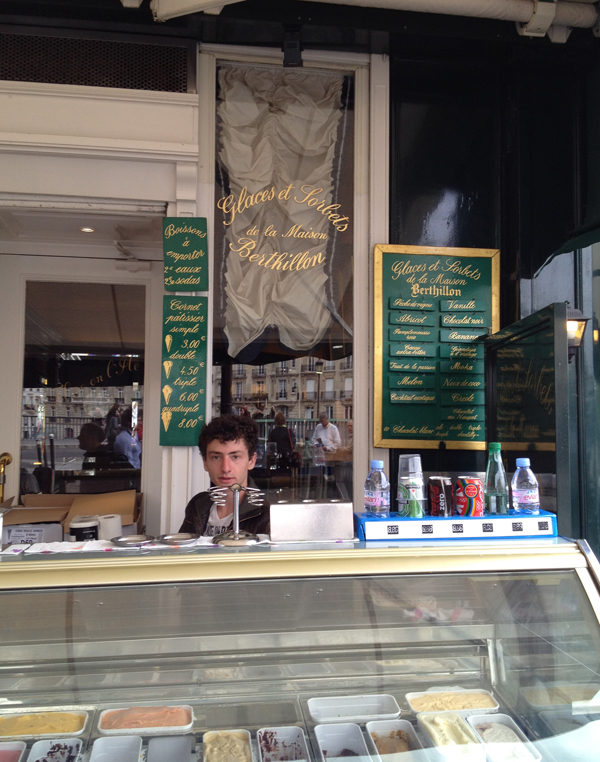 Upon reading the menu we realized of course ice cream served “inside” was not 3.95 euros but 9 euros each. We jumped up and went back to the young man for the ice cream cones. He unapologetically took our orders. The trouble being a Tourist is your money is your most important aspect. Lagging the others, I was walking up the steps to the Musee d’Orsay when a woman holding a child’s hand bent over in front of me. As I side-stepped her, she lifted up a gold wedding band. “Madame,” she said. I glanced at the ring. “It’s not mine,” I said and continued on. I turned around and said “Lucky you.” I heard a French couple following me click their tongues. Then I realized she was pulling the well-practiced Gold Ring trick on me. Once engaged the Trickster tries to get the Tourist to open their wallet. 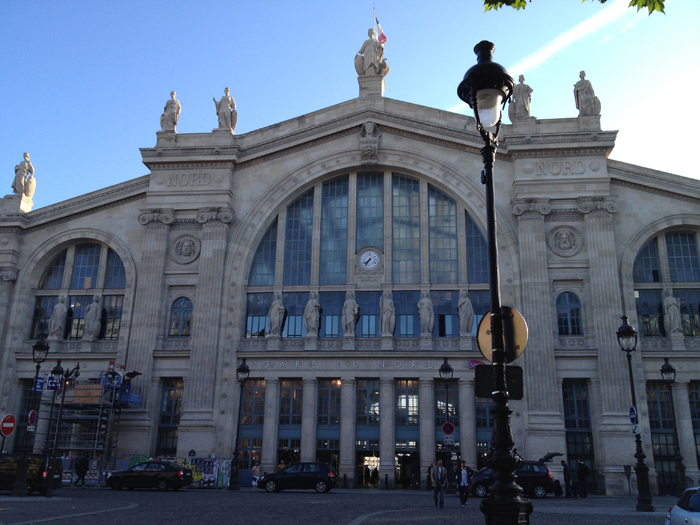 The Gare du Nord train station’s edifice is magnificent but when we went inside to catch the morning Eurostar to London I felt uneasy. The elevator to the second floor was broken. Mojo in the lead, we wandered around like a family of ducks trying to find a way upstairs. Laden with suitcases, we were spotted by a band of pickpockets. Going up the escalator Mojo and I both noticed a couple of young men standing at the bottom watching me. Outside immigration, we had to fill out UK landing cards. Although I tried traveling light, I still had to carry my wallet, passports, phone and ipad in my purse. Opening my bag, I got a pen and set it down on the table. As I reached in to get our passport information, a young man on my right grabbed the pen. “Hey, that’s my pen,” and I snatched it out of his hand, still holding my purse. As I filled out the forms another young man came up on my left and asked to borrow my pen. I glanced at him. He looked nice enough with his curly hair and sweat shirt jacket. 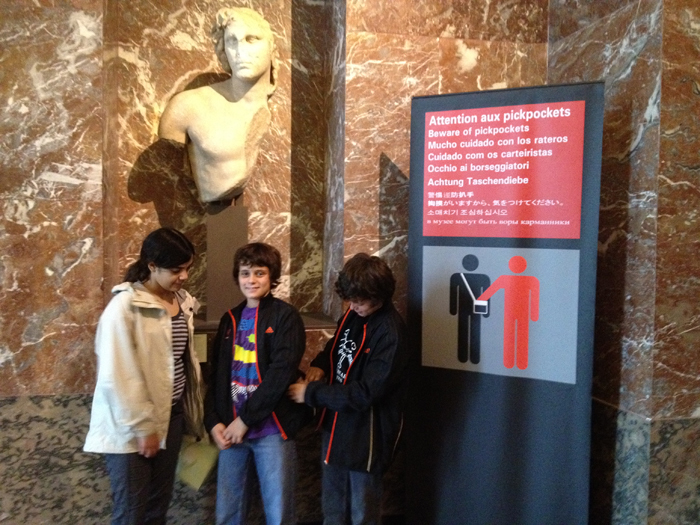 My mind flashed forward to my own boys traveling through Europe with backpacks and no pen. “Sorry, I am using it,” I said politely but firmly. As I wrote he hovered over me and repeatedly asked for my pen. “You’ll have to wait until I am done,” I said using my annoyed mother voice. I knew giving him my pen meant losing it. By the time I finished, he walked away. We went through immigration and customs and waited in the lobby for our friends. They told us the police had hand-cuffed two young men with curly hair who had been following them. “Those were the same guys who kept trying to distract me,” I said realizing how lucky I was. The reality is when consulting a map while taking photos you cannot help but look like a Tourist. I took precautions like placing our passports, extra credit cards and health insurance cards in the hotel safe. Outside, I carried my hotel room key without the room number, one credit card and big bills in different pockets. In my leather purse which wrapped around my body was an old wallet filled with a few euros as bait for the pickpockets. But when I was busy trying to navigate while watching children, I became the easily distracted Tourist. After a sight-seeing vacation, I really appreciate being at home. Despite standing out, I am not a Tourist. Paris sounds like one big con game! Not to be the anti-Paris voice, but for the first time I felt like I really had to be on my toes. Perhaps traveling as families with children, we were too obviously Tourists. Although I did some research and that type of crime is up. Something to be aware of as the Olympics descend on London. Still we had a fantastic time. The weather was cool and a bit rainy. The children were introduced to Paris. And we made it through without becoming Victims.